Fishing in Marathon is spectacular primarily because of its’ geographic location. Marathon is located 80 miles out to sea from the mainland of Florida, and is positioned right between the Atlantic Ocean and the Gulf of Mexico. The fish are everywhere! Just a short boat ride, offshore of Marathon, the “Marathon Key West Hump” rises from the oceans depths of 1,000 feet to a depth of 480 feet. The “hump” is a known feeding ground for many popular game fish like black fin tuna, blue marlin, amberjack and sharks! Additionally, there is also fantastic sport fishing on the Gulf side of Marathon because the waters are deep with less island and flats. 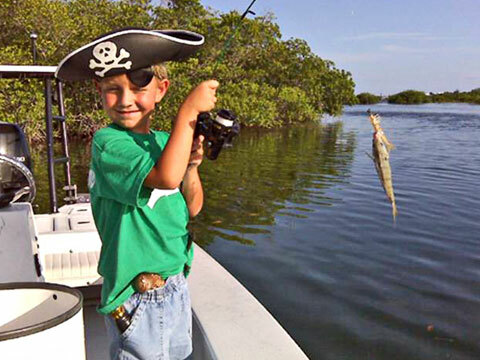 Fishing anywhere Florida waters, when on a boat or from land, a license is requires. These are easily available at all marinas, tackle shops, and the Monroe County Courthouse. The beauty of fishing in Marathon is that if it’s too rough on the Ocean Side, you can easily get to the Gulf side and vice versa. Many sport fishing charters are located in Marathon and Duck Key. The information is easily found at most bait and tackle shops in the area. As a bonus, many motels and resorts in Marathon have their private charter boats or will steer you toward a good commercial charter. Private charters can be expensive, probably over $500. These private boats will take up to 5 or 6 anglers and if you don’t care about sharing a boat, or are interested in splitting the cost on a private charter, this could be right for you. On the other hand, flats or back country fly fishing is extremely exciting and it takes skill and a good guide to outsmart a brainy bonefish, tarpon or permit. Flats fishing usually yields catches called bonefish and are not really editable. Catch and release is the rule so bring your camera! Also, be prepared to leave early in the morning for your Marathon charter and be sure to bring along plenty of water. Sunscreen, long sleeve shirts and a good wide brimmed hat are a must as well as polarized sun glasses to shade your eyes and help you see the fish in the shallow waters. Check out the fishing charter web sites here on KeysTV for additional info as well as Marathon Fishing Video. Another popular water sport in Marathon, FL is Diving. Even though Key Largo may be referred as the Diving Capitol of the world, Marathon has an enormous amount of dive shops and dive charters on its’ own. Water temperatures range from the mid 70’s in the winter to the mid 80’s in the summer, so really anytime is a good time to go diving. The waters are as beautiful as they are warm . Due to diver education, fishing restrictions, and pollution controls,the diving is very good. The reefs are still among the best in the world and generally the visibility is also exceptional. For those who simply want to “get out on the water”, there are many boat rentals and marinas where you can rent a powerboat, kayak or jet ski. Check out the ConchTV boating directory for a list of quality providers, many of which are members of The Marathon Chamber of Commerce.